Liars for Christ - Website of reckersworld! When I was a Christian, I used to put a lot of trust in the leadership of my church. After all, they operated thriving churches, preached powerful sermons, lived what appeared to be virtuous lives. They wouldn’t be in their positions if God hadn’t put them there to begin with. And of course when visiting speakers and evangelists came, I figured they must be reputable, they must be genuine, after all my church leaders wouldn’t have brought them in if that wasn’t the case. So yeah I but a lot of stock in visiting preachers and evangelists. People who drew large crowds and who seemed dynamic and seemed to be legitimate. I figured they were like spokes people from god and if they said something, then it had to be from God. However in the early 90s I learnt that perhaps they couldn't be relied upon. One day my church (one of the most thriving churches in Auckland) had a guy come from the USA. A former WWF pro-wrestler I’d never heard of. I think his name was Jim Stinton or something like that. I was a huge wrestling fan so thought, yeah, I have to hear this guy. I figured he must have been some jobber in the WWF, one of those guys whose names you never remembered and who were only ever there to get beat by the big WWF stars. 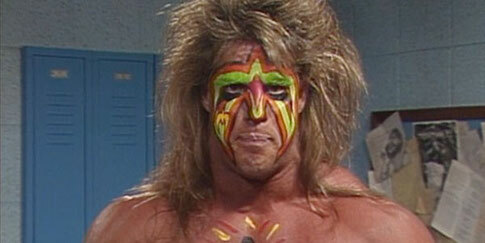 The Ultimate Warrior. Six foot 8?? This sermon he was preaching was about faith and how the Warrior had this great faith when he went into his match against the Honky Tonk Man (as if faith was ever needed in this particular sport). Clearly this conversation never went down this way, if ever at all. Any pro-wrestling fan knows… even back in the early 90s that if a title was going to change hands it had been planned well in advance. There was no question that the Ultimate Warrior was going to destroy the Honky Tonk Man in under 30 seconds, because that was the plan. Jim Stinton, being a pro-wrestler himself would have known this full well and the Warrior would not have laughed in such a haughty manner, even if he had been asked such an ignorant question by a fellow pro-wrestler. I didn’t argue. I just went away, pissed that the guy could so blatantly lie to people, when he was supposed to be there as God’s spokesperson. Here he is talking about pro-wrestling as if it's real and then goes on to talk about God and stuff in the bible? Perhaps he realises that's as fake as wrestling? Perhaps one bunch of fairy tales goes hand in hand with another bunch of fairy tales so it becomes so easy to lie? Funnily enough, I just put this down to one bad egg and continued to trust evangelists. It wasn’t until a lot later on, when I was struggling with my faith and I thought back to this incident it made me realise that just because someone stands in the pulpit and tells a story, doesn’t make it true. How much stuff is made up? How much is exaggerated? We just never know and if it’s so easy for an evangelist to blatantly lie to a congregation about something like pro-wrestling, what else can it be easy to lie about? Can anyone standing in the pulpit preaching be trusted? For that matter can even the words of a holy book be trusted? Is it possible that even guys like Moses, Paul or perhaps even Jesus himself lied? We can just never know for sure. So if someone starts preaching, be aware. It’s not a big deal for God’s so-called spokes people to lie and it may even be that those who put trust in them to be spokespeople may not even be aware that they’re endorsing liars.